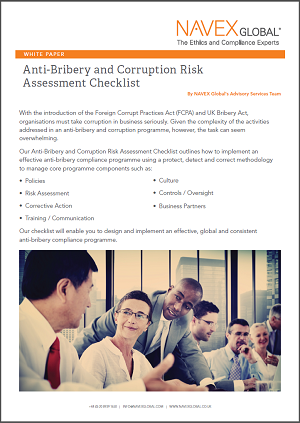 Knowing which steps to take to ensure your organisation remains vigilant against bribery and corruption is an important move. When your organisation is aligned on anti-bribery and corruption policy, training and third party risk, your employees can identify, report and ultimately stamp out—bribery and corruption. Our Solutions Experts can help you strengthen your most challenging ABC issues and better protect your organisation. Contact us to set up a consultation today at info@navexglobal.com.